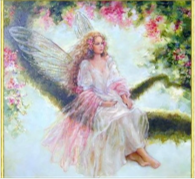 This lovely attunement connects you to the healing energy of the faeries. The founder of this system, Violet Paille tells of an out of body experience she had during an attunement to Celtic Reiki. She traveled through the mists of Avalon, meeting faeries that showed her the “Otherworld”. While on this amazing journey she was given seven symbols and ways to use them to work with the energies. You will learn the lore of many different types of faeries including Elemental faeries and what they do. Also explained is how to create and dedicate your own faery garden.